When you need to charge for activities that are not automatically invoiced by Wild Apricot, you can issue a manual invoice. Members can log in to Wild Apricot and pay these manual invoices from their profile, or an administrator can record a manual payment and settle the payment to the invoice. There are two ways to issue a manual invoice: from a contact's details, and from the Finances module. Click the Financial transactions link in the upper right corner of the details page. Click the Add invoice button. You can now enter invoice details and finalize the invoice. See Entering invoice details (below). Hover over the Finances menu and click the Invoices option. 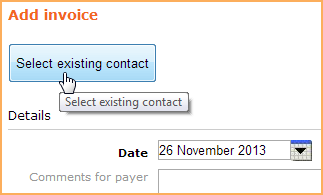 Choose the contact to be invoiced then click the Select button. 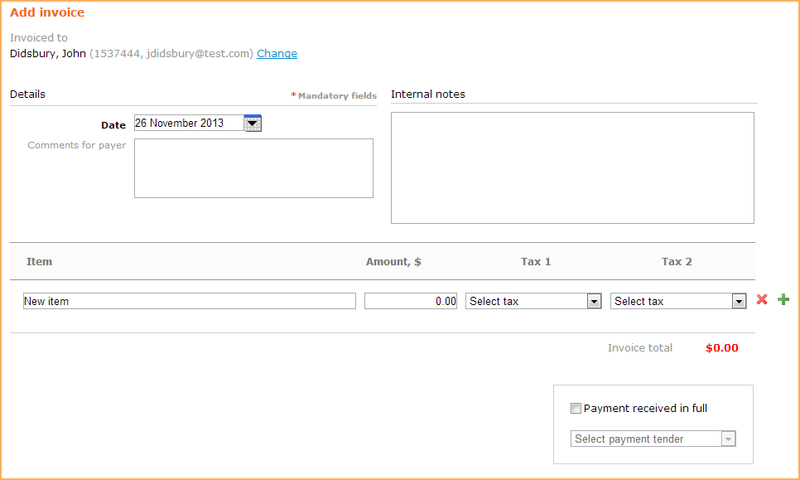 From the Add invoice screen, you can enter invoice details and finalize the invoice. After selecting the contact to be invoiced and clicking the Add invoice button (in whichever order), the Add invoice screen appears. From here, you can enter invoice details and finalize the invoice. For event registrations, and membership applications and renewals, you can assign the invoice to a different contact before saving by clicking the Change link. Under Details, you can set the date of the invoice, either in the past or future, and enter comments that appear on the final invoice. Under Internal notes you add any comments or notes you may have about the invoice. These notes are only visible to the administrator on the invoice list and invoice details screens, and are searchable. In the bottom half of the Add invoice screen, you can add line items to the invoice. Enter the name of the item in the first text box, and the cost of the item in the second box. Then, you can select up to two taxes for the transaction. To add another line item, click the green plus sign beside the last item. To remove a line item, click the red X. The total will be automatically calculated and displayed below. 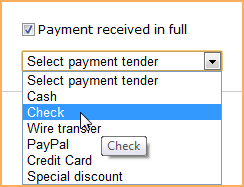 If you have already been paid in full, check the Payment received in full checkbox and select the payment tender. Otherwise, payment will be automatically recorded once the invoice is paid online – or you can record the payment manually once received. View, print, or email the client copy of the invoice to the contact (see Emailing or printing invoices). Email the invoice without previewing it. Record and settle the payment (see Settling payments to invoices). Process a charge on this person's credit card (assuming that full credit card and billing information has been provided to you outside of Wild Apricot). See Processing credit card option for administrator. Make changes to the invoice (see Adjusting, voiding, and deleting invoices). Cancel the invoice (see Adjusting, voiding, and deleting invoices). The invoice is now available to the contact from their profile. From there, they can pay the invoice (see Member invoices and payments).